Infrastructure As An Asset Class is the leading infrastructure investment guide, with comprehensive coverage and in-depth expert insight. This new second edition has been fully updated to reflect the current state of the global infrastructure market, its sector and capital requirements, and provides a valuable overview of the knowledge base required to enter the market securely. Step-by-step guidance walks you through individual infrastructure assets, emphasizing project financing structures, risk analysis, instruments to help you understand the mechanics of this complex, but potentially rewarding, market. New chapters explore energy, renewable energy, transmission and sustainability, providing a close analysis of these increasingly lucrative areas. The risk profile of an asset varies depending on stage, sector and country, but the individual structure is most important in determining the risk/return profile. This book provides clear, detailed explanations and invaluable insight from a leading practitioner to give you a solid understanding of the global infrastructure market. Infrastructure continues to be an area of global investment growth, both in the developed world and in emerging markets. Conditions continually change, markets shift and new considerations arise; only the most current reference can supply the right information practitioners need to be successful. 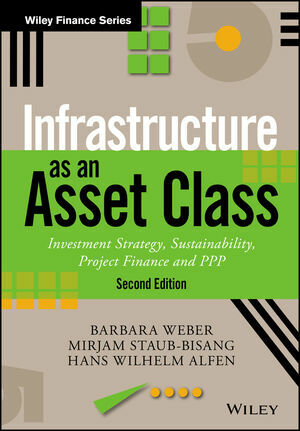 Infrastructure As An Asset Class provides clear reference based on the current global infrastructure markets, with in-depth analysis and expert guidance toward effective infrastructure investment. BARBARA WEBER is founding partner of B Capital Partners AG in Zurich, an investment advisory firm focused on institutional private equity portfolios and specialising in infrastructure and clean energy. MIRJAM STAUB-BISANG is CEO of Independent Capital Group AG in Zurich, an asset management and real estate investment company focused on sustainable investing across asset classes. HANS WILHELM ALFEN is chair of construction economics at the Bauhaus-Universität Weimar in Germany and general manager and founder of Alfen Consult GmbH, Weimar.